When brothers Nathan and Bub find themselves reunited, it's not under happy circumstances. The pair meet at the legendary Stockman's Grave in the harsh outback of Queensland, Australia, after the discovery of the body of their brother, Cameron. Cameron was seemingly killed by the harshness of the unforgiving Australian sun and was trying to find shelter in the small amount of shade provided by the grave - in a land where you will pass no landmarks and meet no other person for miles. Only it quickly becomes apparent that not everything about Cameron's death adds up. It appears he left his car which was in full working order and stocked with food and water - and wandered off into the outback. Cameron had lived in the outback all of his life- he knew the ground, he knew the surroundings and he knew the danger. So why did he choose to put himself in such a vulnerable position? Was it planned? Or was there more to Cameron's death than first appears? The Lost Man is probably one of my most anticipated reads for 2019. I've been desperate to read more from Jane Harper as soon as I turned the last page of Force of Nature last year. She completely enthralled me with her writing and I became so embroiled in her storytelling that real life became a massive inconvenience - I just HAD to get to the end of the story and find out what happened. The Lost Man was absolutely no different; one of the most addictive, compelling and utterly riveting books I think I have EVER read. I firstly need to talk about the setting. I never thought I would be so terrified of reading about a place, but Jane's writing is so atmospheric and descriptive that I couldn't help but feel utterly terrified by the outback. The sparseness, the unforgiving heat and the sheer force of nature. It is both incredible and terrifying at the same time. Jane really brought this setting to life for me and I feel as though that is half the battle with writing such a good story. It got into my mind and I couldn't stop thinking about it...The way the hardened locals lived their lives and adapted to living in such harsh yet beautiful conditions was fascinating. 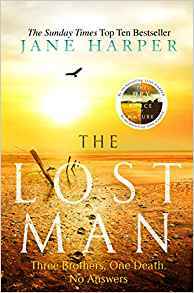 Jane certainly pulls no punches with getting the story going as we experience a death seemingly caused by the unforgiving outback within the first few pages. 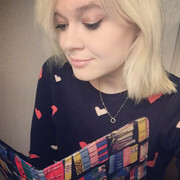 (She knows how to get a reader hooked!) and the pace doesn't slow down from here on in. Our narrator is Nathan, the eldest of the three Bright brothers. Throughout the story we get to experience flashbacks to events that have taken place in the past - and slowly begin to learn why there appeared to be so much bad blood between the family. I was especially intrigued to find out what the situation was with Cameron's wife, Ilse (and that's all I'm saying on the matter!) I found the majority of the characters to be incredibly fascinating, they all had a backstory, reminding us of the complexities that can be found within family life. 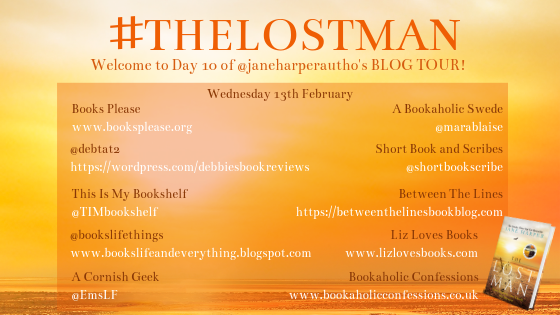 A huge thank you to Caolinn at Little Brown for the opportunity to be part of the blog tour for #TheLostMan.